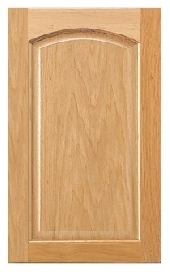 Rustic Cherry is a rich and multi-colored hardwood distinguished by its flowing grain pattern. Color varies from light to deep reddish brown and will darken or mellow with age. This will be more noticeable with natural or light stain finishes. This dramatic color change will occur with exposure to light and usually takes place within the first six months. Mineral streaks, pitch pockets, pin knots and sapwood all occur naturally in cherry and are acceptable characteristics and not considered warranty defects. 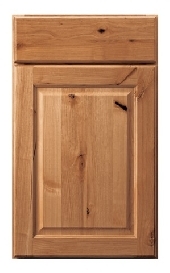 On Rustic Cherry cabinets,the door center panel and drawer fronts are changed to the rustic material. The cabinet frames, door frames, veneer end panels, and accessories are clear. • Knots – solid, with no loose material, the knots can be open up to 5/32". • Heartwood and Sapwood – Heartwood is the center part of the log. It is usually darker than the surrounding Sapwood which is considered the “living” part of the tree. This is especially true with Hickory where the contrast can be dramatic. • Pitch pockets – these are openings in the Sapwood where sap has accumulated. • Checks and splits – these are cracks in the wood where the wood cells have split. • Mineral streaks – form when trees absorb minerals from the soil and stain the wood fiber. The Rustic cabinetry you buy can have some or all of these elements. They are distributed randomly by nature. This gives the cabinetry its rustic appeal. Having the entire cabinet be made of rustic material would be too much and overpower the room. 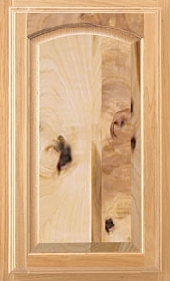 Cabinets that have rustic parts are specified to have; one third knots, one third rustic characteristics other than knots, and one third clear. This has proven to be the most aesthetically appealing ratio. 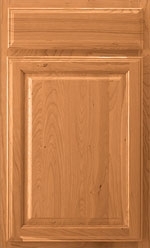 It is possible that a random door or drawer front will not have a knot or characteristic. This is by design for a better visual appearance and not considered a quality defect.